WiredTree began providing hosting services in 2006 and have managed to gain a considerable amount of clients in the managed web hosting business. WiredTree is a fully managed VPS and dedicated server hosting company, which runs on the most up to date software solutions available for high grade servers. Unlike some other companies, all of the virtual private servers offered by WiredTree are fully managed, leaving you with no maintenance work. In this WiredTree VPS review, we will be looking at the features, support services, reliability and performance of the servers. First up is the VPS1000 from WiredTree which is run on an Intel Dual Xeon processor with eight CPU’s. This VPS offers 1GB guaranteed RAM, 100GB space, 3TB bandwidth, four dedicated IP addresses and cPanel/WHM. All servers offered by WiredTree have the option to include auto installers, Light Speed, WHMCS and RVSKIN. The second tier VPS is only a bump above the first one, as it gives you 120GB space, 3500GB bandwidth and the same number of IP addresses. The last tier VPS plan is also only a tad better in terms of the specifications. If you are looking for a wider range of VPS plans, you may find better options with other hosting companies. However, apart from the minimal specifications on these VPS servers, you have to keep in mind that all these servers remain fully managed. You have absolutely nothing to do in terms of maintenance or upgrades, as WiredTree controls everything. The company gives you proactive server monitoring around the clock with a 100% node uptime guarantee. You can have peace of mind with WiredTree, knowing that they are handling everything including nightly backups. Despite the fact that WiredTree manages your VPS server, they do offer 24/7 support for all technical issues. WiredTree has real time phone support with a US based call center that takes in all customer support requests. Your servers are monitored to ensure that they are running at the highest level of performance without any form of security risk. 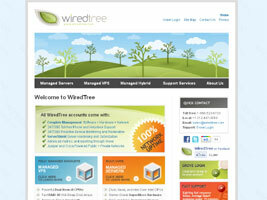 WiredTree includes hardware management with their support services, which includes one hour hardware replacements. The same applies for network issues that need to be fixed within a certain amount of time. We have tried WiredTree in the past and can safely say that they do offer a good fully managed service. The ability to offer the best uptime and performance is crucial for every web hosting company in the business. WiredTree strives to provide very good reliability by offering services such as Server Shield and Parallel based monitoring. The service agreement states that the company promises to offer 100% uptime every single month. If the company passes up on this policy, they will refund five percent of your monthly credit to make up for any loses. If there is a situation where a VPS server needs a hardware replacement; WiredTree will get it done within an hour or you get a five percent credit on your account. The ability to offer 100% uptime is thanks to the hybrid nodes that WiredTree uses for all virtual private servers. If you are only considering value, WiredTree may not be at the top of your list, but they remain as one of the best for offering fully managed VPS servers. Most websites owners have very little server management experience, so they would want a VPS that is managed by the host. WiredTree offers you three basic plans as mentioned before, with pricing denominations of $49/month, $69/month and $89/month respectively. Based on your needs, you could choose a plan that works for you. If the specifications aren’t good enough, you can add more specs for an additional cost.